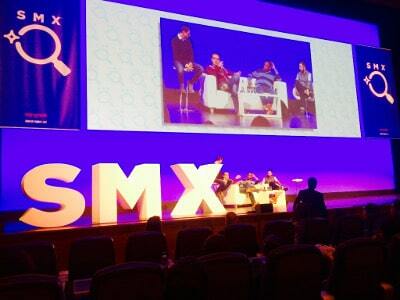 Partager la publication "SMX München 2016 – online visibility is driven by the user experience"
In this changing context, what are the consistent KPI’s to monitor? Webmecanik has attended to its first event in Germany last week. The Search Marketing Exposition is a cycle of conferences, attracting world-famous speakers in the field of digital marketing. Rand Fishkin (MOZ) has opened the first session with a vibrant speech about the last trends in SEO regarding recent evolutions of Google Search. The user experience is on its edge. And there will no longer be “tricks” to catch traffic online. The behaviour of thousand of visitors will now drive online visibility, i.e. a website will access top-rankings when delivering the right information available in a way visitors expect to access it! This statement sounds pretty obvious. Nevertheless, I have recently found myself looking for very specific information about VAT in Germany. Guess what? It took me around 15 different Google-requests, and the visit of twice the number of websites to find an acceptable answer. This example illustrates a common lack in any too-specific market: “not enough requests” equals “not enough interest”. Which also means: no effort made by digital marketers - together with agencies - as the market is not asking for it. But I’d rather see it this way: being different, specific, out of the crowd… is THE way to attract a qualified traffic guarantying the so-much-awaited ROI. Tell your clients that a small but qualified and regular traffic shows better ROI than a lot of random visitors. You can quote Rand Fishkin who fights against the number of visitors clicking on “back” after realizing they were not on the right page. The number of “back-clicks” shall be a KPI to monitor. 2. Qualify online traffic. Increase conversion rate. Whereas M. Fishkin, I wont ask you to quote me… But talking about specific demand, I love to paraphrase Paretto’s law and apply it to business. The idea is that many companies I have met in B2B make 80% of their annual revenue with the top 20% of their clients. The acceptable reason justifying the absence of focus on 4 out of 5 clients is – again – the ROI. The time spent on key accounts is crucial indeed. Still, when some pages on one’s website are answering a specific demand, they shall attract a qualified traffic. Meaning higher conversion rate. In this context, the KPI to monitor is not the traffic per se, but rather the conversion rate. Traffic acquisition is a long-term effort. PPC keeps making it more and more expensive. The third KPI focuses on the advocacy of converted visitors. Marketing automation makes it possible to qualify, segment, score and get in touch with the most interested leads. As you might have paid to attract them, it would be a waste of money not to turn them into your future ambassadors. The follow-up of incoming leads’ score is the last KPI. This one indicates the advocacy of your visitors, which answer Google’s newest expectation. You’ve provided your visitors with the experience they were looking for, they even might quote you with an ad-hoc backlink… And your natural ranking has just improved!